Unwind the distress of urban life, unlearn the acquired circadian rhythm and undo the toxic damage done by the city life is what you intend when you head to such a place. I feel we do so much damage to our circadian rhythm in our working city life that it needs a repair in between. Heading towards the hills just to stay put for a few days is such a relief we experienced while spending time in Goshaini. Yes, we had planned we will not do any treks and hikes and just laze around for 5 days. Although we ended up doing a few impromptu hikes around the valley. 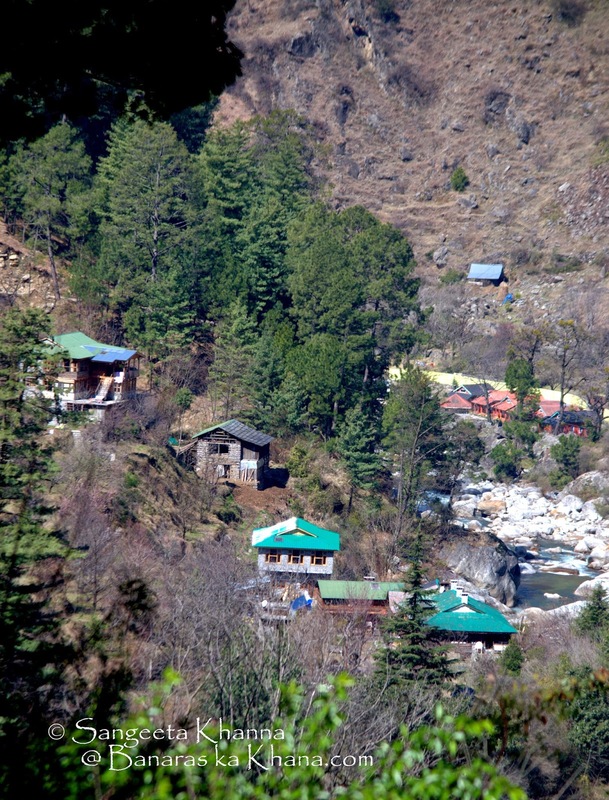 Goshaini is a small village located in Teerthan valley (Post Banjaar, State Himachal Pradesh) and falls in the Ecozone of The Great Himalayan National Park. Can you imagine we did not even go the the National Park while we were stationed there. But we had a plan to rest and that we did, planned the National Park visit for a few months later. Last May a blogger friend Dhiren had gone to Goshaini and had come to my home driving back from there. 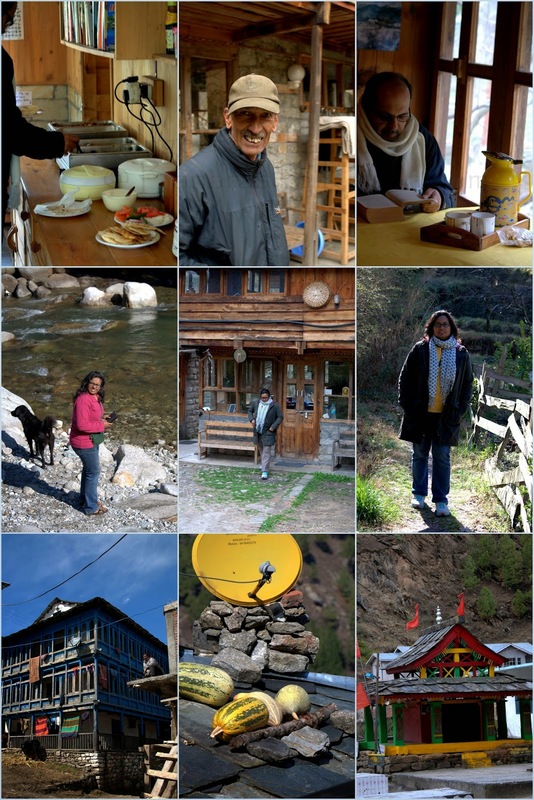 And the way he praised this home stay at Raju's cottage both of us felt like going there at once. We tried to find a booking during our holidays but Raju's cottage is so popular it is always full, so we booked for the extended Holi weekend almost 8 months in advance. It was totally worth the wait and the commute. Note that we had to wait this long because both of us could not get free dates in the coming months due to work and other travel plans, and in the summer when we had time the homestay was busy mostly with families with school going kids. You can get bookings for your choice of dates if you are lucky. You will fell like going there right away once you know what it is. Read on. 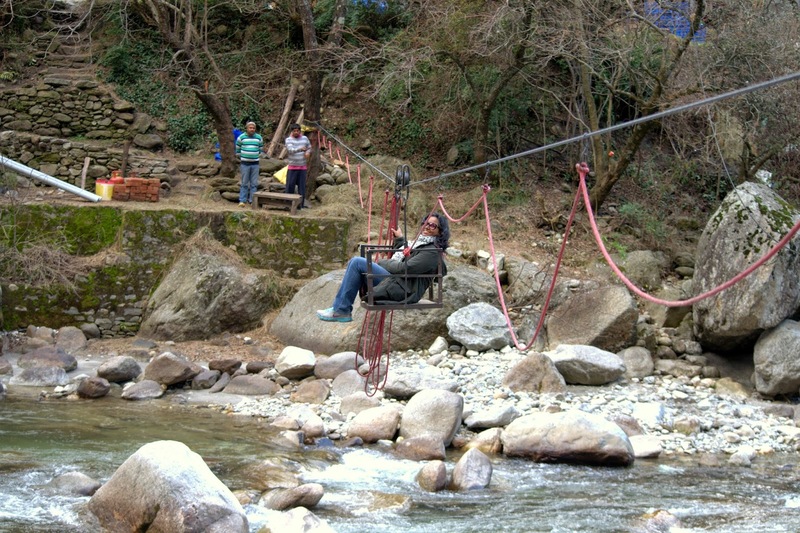 And this is how you cross the gurgling Teerthan river to reach Raju's cottage. The fun begins. And mind you, not the city life kind of fun, this is for real, with real elements of nature thrown in for good measure. 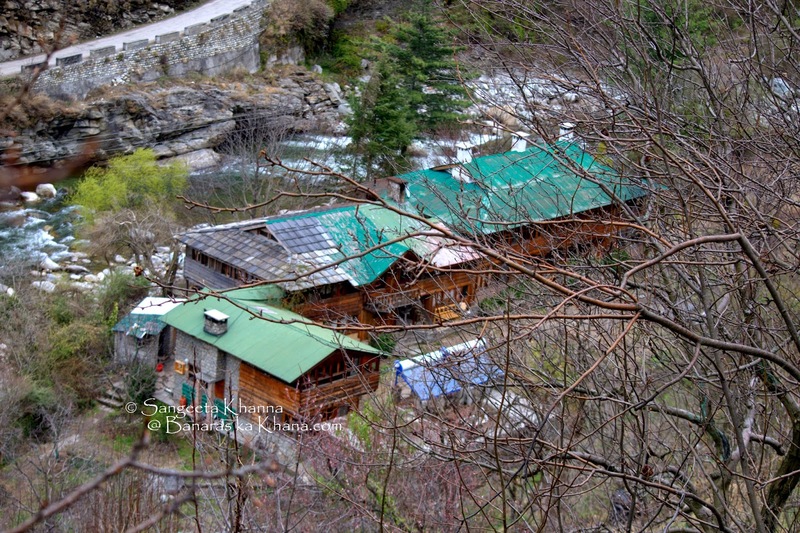 Raju's cottage is a green roofed, wooden cottage that looks like this from the main road just a kilometer short of Goshaini bazar. 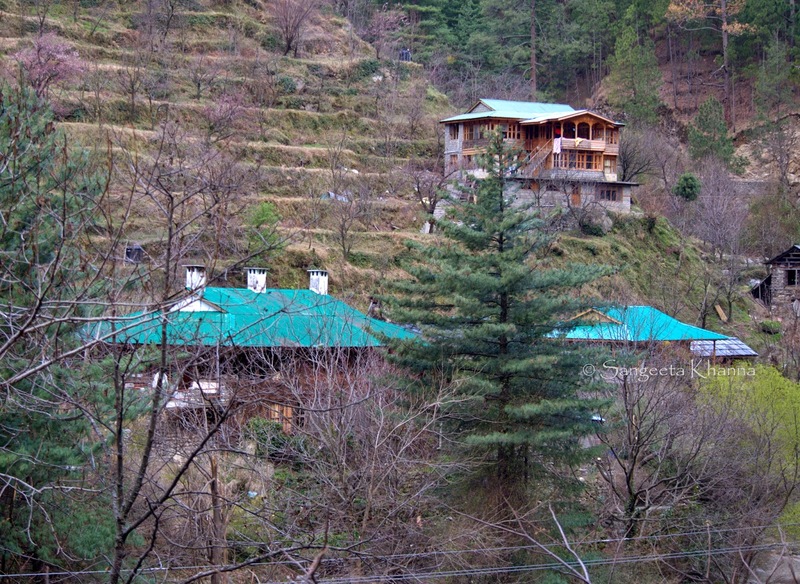 Our abode for five days, a peaceful home stay located at the base of apple orchards of Raju Bharti's family. That terraced landscape in the background of the cottage looks barren as it was just after the snow season and all the apple, pear, cherry, apricot and many other fruit trees were all barren. We would sleep, read books, eat great food cooked by Lata ji (Raju Bharti's wife) and just laze around in the sun. But almost everyday we would go for long walks that would turn out to be at least 3-4 hours hike in the forests or neighboring villages. Just loitering around aimlessly and return for a late lunch. Look at the people we met and talked along the way every day. 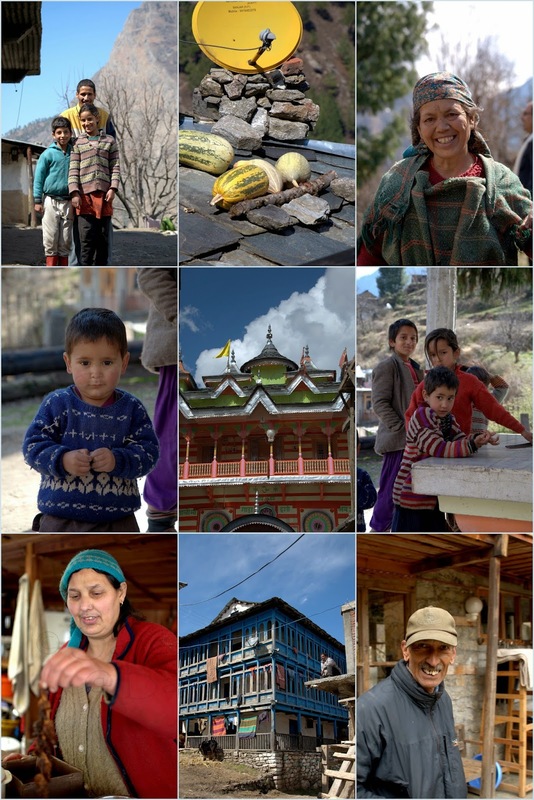 Huge pumpkins and hill cucumbers perched on slate tiled roofs, kids peeping from windows, coming to greet us and offering candies was common. Where do you find such simplicity and honest smiles in the cities? Raju's cottage looked like this when we went up to the forest on one side. And like this when we climbed steep hills and some concrete steps to reach Bandal village. The view below is when you climb about 30 minutes from Goshaini towards Bandal. We found several birds and photographed loads of them. Will share more pictures of birds really soon. 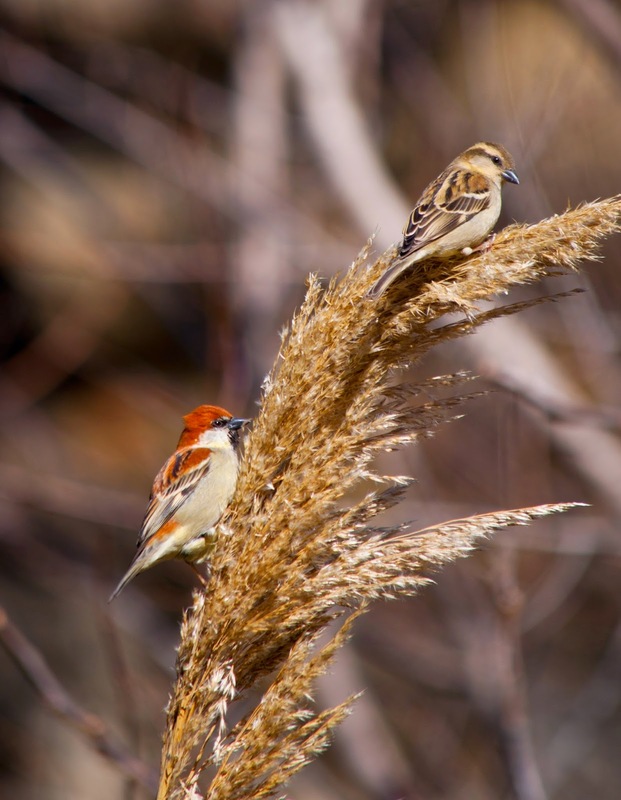 These are Russet Sparrows (a couple) enjoying their lunch. 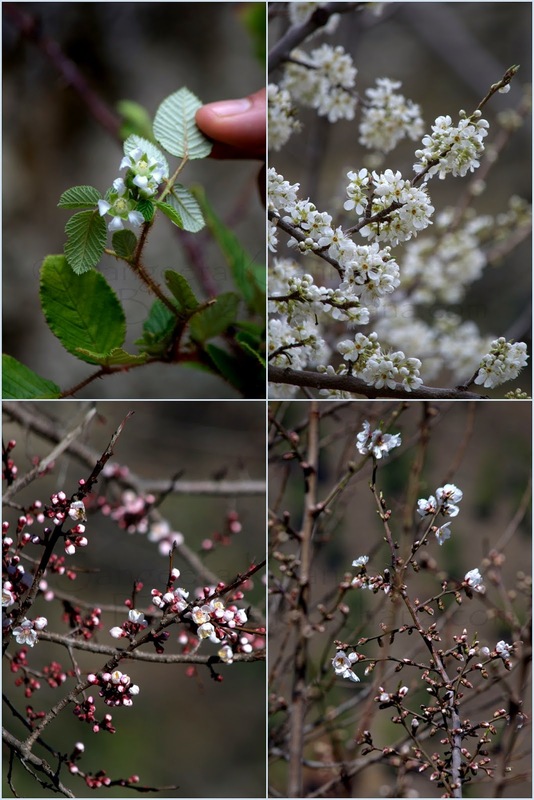 Some of the Apricot and Plum trees had just started blooming. I even found Himalayan raspberries blooming, the one with Arvind's thumb is raspberry blossom. Himalayan raspberry is called Hisalu in Uttarakhand, might have a different name in Himachal. 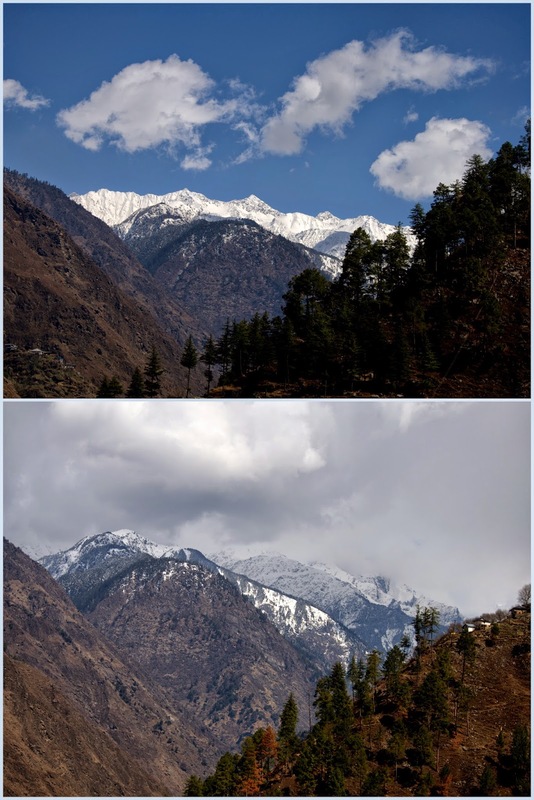 It was first week of March, still freezing cold after a bout of snow in the valley and everyday we would see fresh snow on the neighboring peaks. It was raining a lot quite uncharacteristic to the month of March but was sunny enough to see the spring knocking at the door. Many stretches along the Teerthan valley had Plum orchards that looked painted white by the fresh blossom. Although there was a real danger of the pollens washing away and destroying the plum harvest this year. 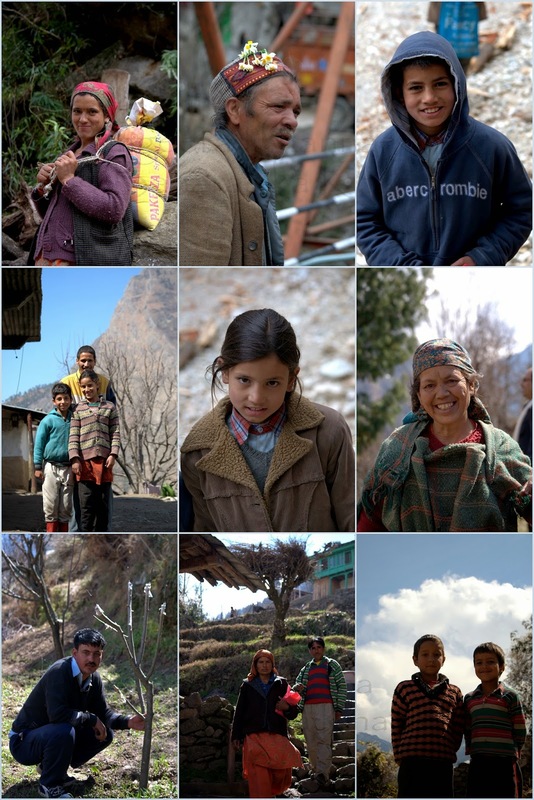 We walked and hiked, finding new openings into the valley, witnessing new peaks, some shining with snow and some crowned with conifers, a lone house perched on a cliff, few kids playing cricket on any plain stretch of land available. We wold stop, breath in the crisp fresh air, ruffle the hill dogs and move on. We were always late for the designated lunch time but would get a hot and fresh lunch served in the common dining room. 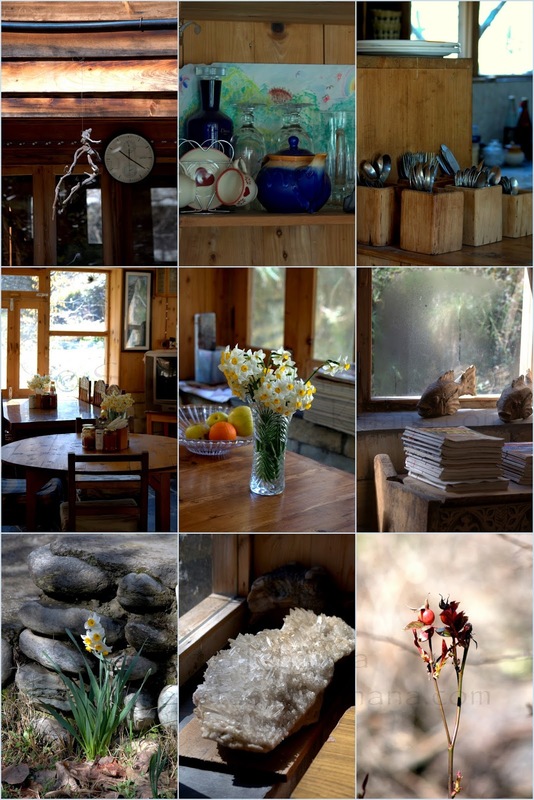 I must mention that Raju's cottage has a common dining room, a vibrant place decked up with books, wooden artifacts and painted pebbles kept on the windowsills. The most interesting thing that I found were the huge crystal rocks placed everywhere. There were a few crystal rocks even in our rooms. All the artwork is made by the guests staying there or is sent by them as a gesture of gratitude. Food is served fresh, the curries and daal placed in hot plates, rice served in hot case casseroles and hot rotis being brought to each guest as you eat. 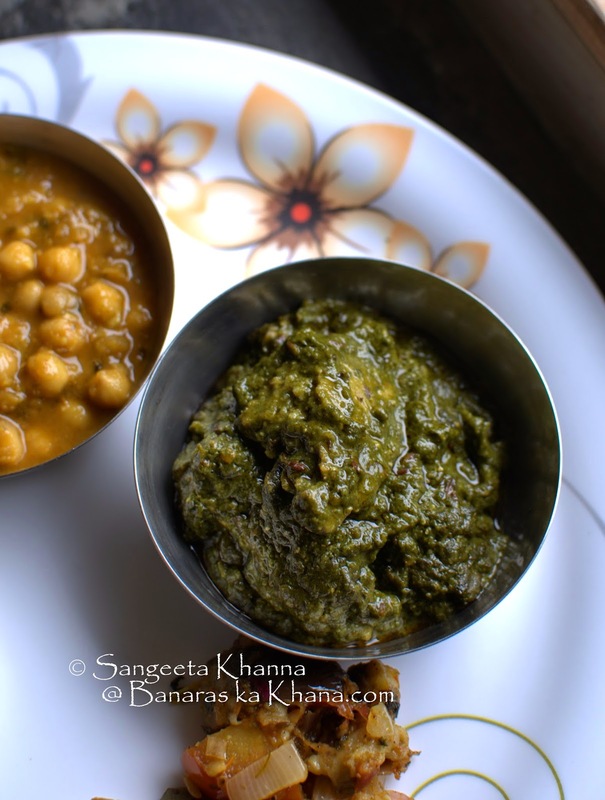 Indian home style food and some local regional food with vegetarian and non vegetarian choices is what you would expect in such places but the warmth that you find here is something to cherish. Absolutely home style meals served just like food is served in joint families, I loved this part quite a lot, more so because food is always a special experience for me. Raju's cottage and Lata ji's cooking didn't disappoint me even taste wise. See what all we had. Traditional Himachali sidu, the steamed (leavened) whole wheat bread stuffed with poppy seed paste, served with a dollop of home made ghee. The ghee had such an intoxicating flavour of nostalgia, reminded me of the ghee my grandmother would bring from our village. Slightly smoky and so flavourful, the sidu is steamed over leaves of galgal lemons (large pahadi lemons). Ghee is made by the milk they get from the cowshed they maintain. All the milk, yogurt and paneer they use come from their own cows. How cool is that. 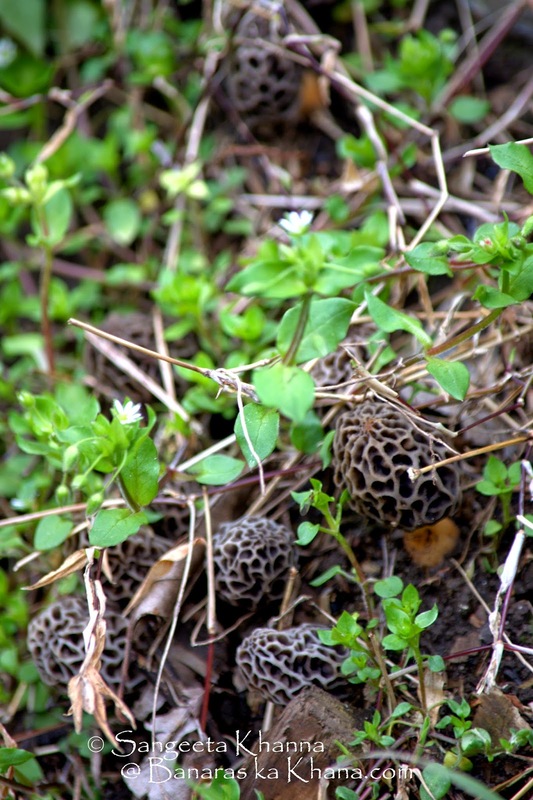 I spotted morels growing in Raju's orchard, it was the first time I had seen them growing wild like this. 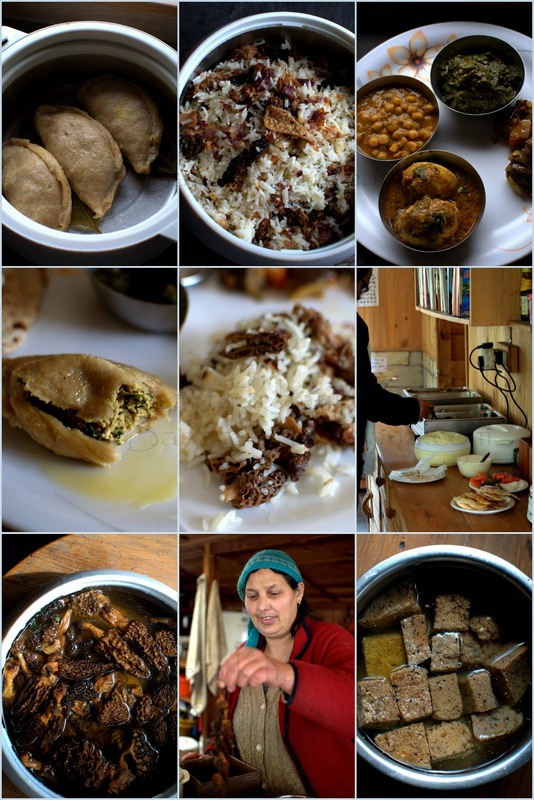 Seeing my interest in morels, Lata ji cooked guchhi pulao (morel pilaf) one day. Her chciken and mutton curries are to die for. 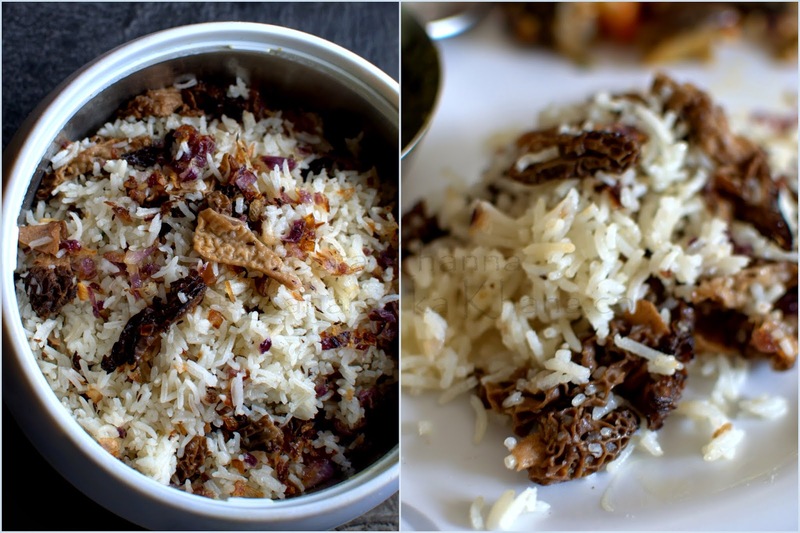 Look at this gucchi pulao (morel pilaf). And that is a lot of morels considering it is so costly. 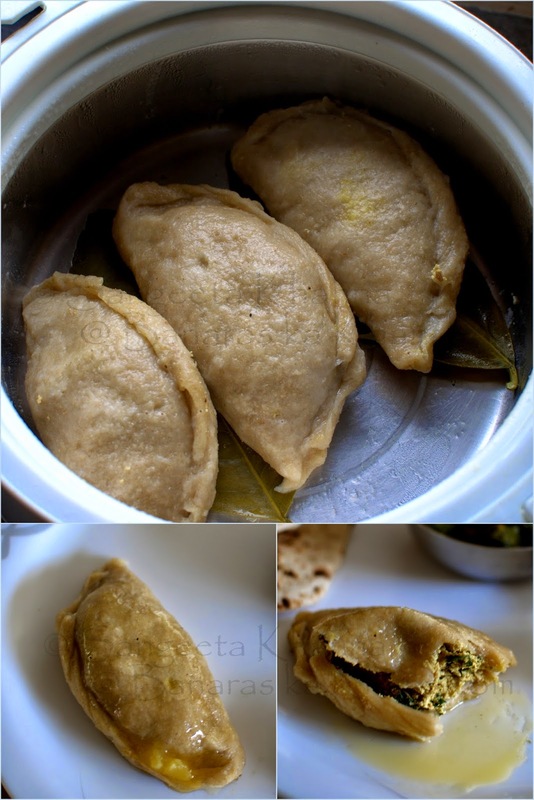 Here is sepu wadi (urad daal dumplings in spinach gravy) which is a popular recipe served in Himachal Dhams (wedding parties). A uniquely aromatic curry that I learnt cooking and recreated in my own kitchen after returning. Sepu wadi recipe will be shared shortly. Getting breathless climbing mountains, returning hungry and being treated with such warming food is bliss. We did not want to come back. Did I mention that each room at Raju's cottage has a small bookshelf too. At least our room had one and three extra rooms around the bedroom to laze around. Two of those rooms were river facing, the bathroom was also river facing and very very cold due to that. But thank God they rarely have power cuts so hot water was not a problem. They have installed solar heaters for the main kitchen and guest bathrooms too. There are solar lanterns for the guests if they have to go around in the night. Raju Bharti is an interesting person, his father was a local MLA as he told and seems to have done remarkable work in the area. Raju himself has filed cases against corporates who wanted to build dams up the river and had arranged government sanction too. He was able to stop the making of dams on the Teerthan river and considers the river as her Goddess. 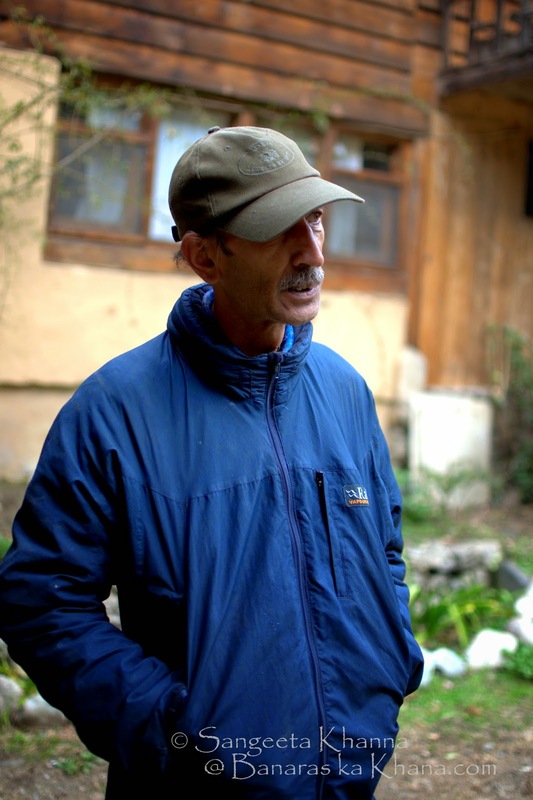 He is a member of various committees overlooking the management of The Great Himalayan National Park and takes active interest in conservation of the mountain ecology. In fact if I write about all that we talked with him it will be a full fledged article here. Raju's family has a few dogs and cats who are very friendly to the guests and the dogs are even trained to accompany them if they go to hikes alone. 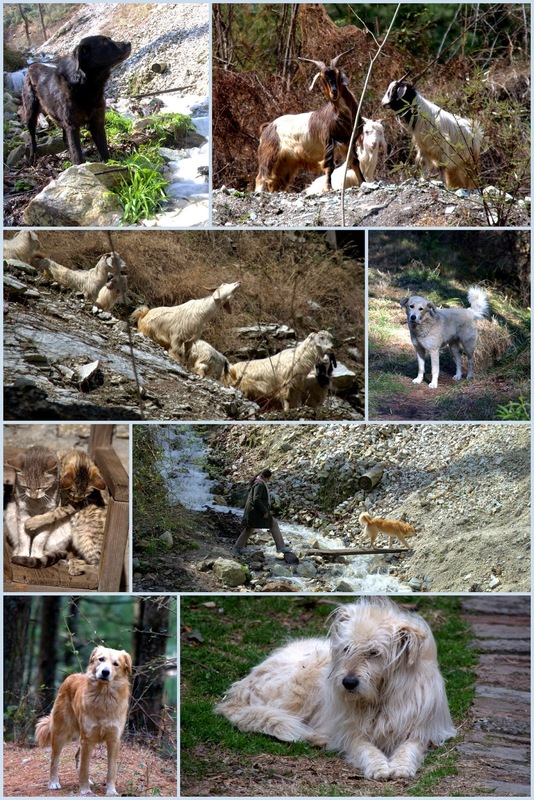 The dogs are named Goju, Bhalu, Bulbul and Yeti. They walk along and keep looking back to assure you are following them, else they will come back and sit with you while you gaze at the mountains and birds and the scalloped sky all around this valley. The mountain goats will be curious about you but oblivious to the beauty surrounding them. You feel like you are the odd one in this beautiful place and then you wish to come back and fit in better. I appreciate what Raju's family is doing at his fruit orchard too, growing everything organically and rearing cows for milk for the family as well as for the guests. Raju's cottage is run completely by his family members and they take pride in it. His two sons, Karan and Varun manage the everyday operations and his wife Lata ji cooks all the food with the help of lady who comes from the village to help in the kitchen chores. His nephew Vicky serves food to all guests and keeps asking for tea and coffee in between. All done with a smile. Karan and Varun will coordinate with you once they confirm booking. You can get an overnight bus from Delhi, a few buses start from Himachal Bhavan (Mandi House) and others from ISBT, deboard the bus just before the Aut tunnel and Raju will arrange a cab pick up from there. You need to tell the bus driver in advance about your destination so he will let you know when it is time. You can contact Raju and his sons at his facebook page here to book and coordinate for cab pick up. They feel like an extended family to me now. Isn't that a great achievement? No, not for them, I am talking about myself. What a beautiful post. Make you want to go there right now. Will definitely visit. Sangeeta i really envy you. Please keep them coming so that i can follow my dream through you.